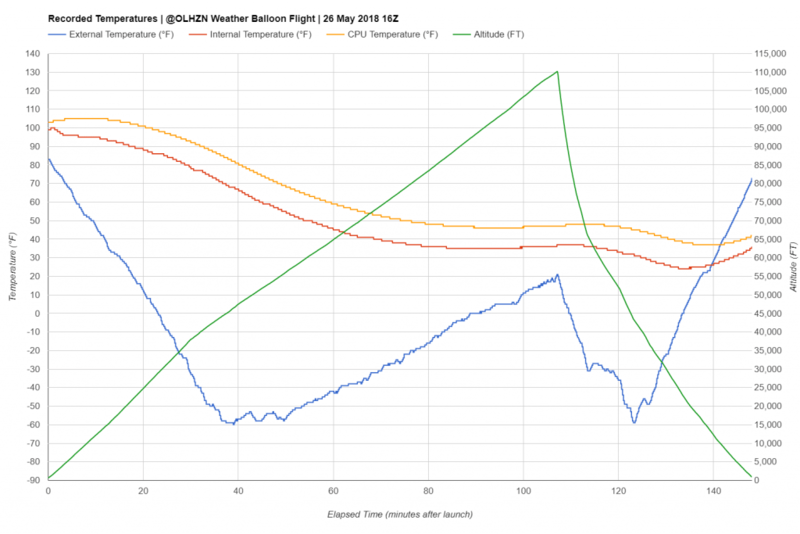 OLHZN-12 was the twelfth high altitude weather balloon flight for Overlook Horizon High Altitude Balloons. 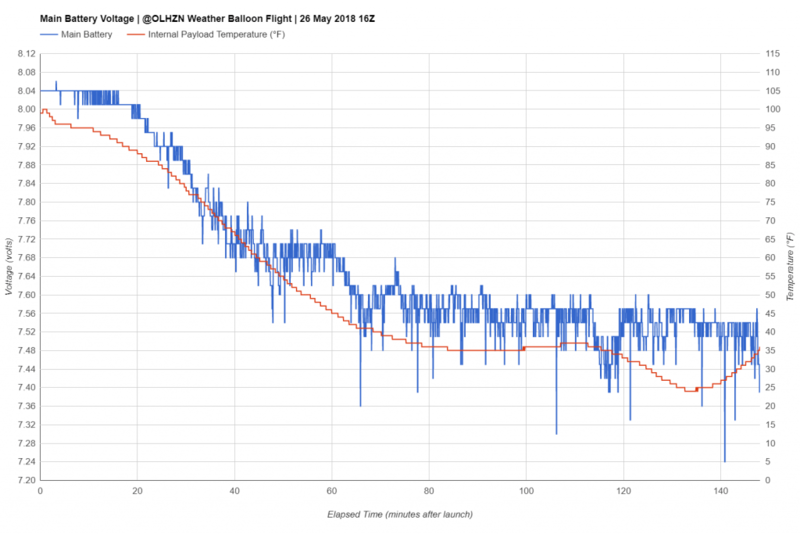 This flight launched on May 26, 2018 at 12:03pm EDT (16:03 UTC) and carried 3 onboard Lightdow LD4000 Cameras along with our new micro-payload that was introduced on OLHZN-10. This flight also debuted our new on-board landing prediction software that had the payload provide predictions of its own landing site ahead of time and relay that information to the ground crew (and anyone following our live flight map) to get our chase team as close as possible to the landing site as the balloon descended. This flight was another huge success for us! We expected to have partly sunny skies for this flight, however, the cloud coverage turned out to be much more than expected which resulted in very cloudy skies in our photos and videos. The launch procedures for this flight went very well and the countdown proceeded normally until about T- 5 minutes when an audible alarm could be heard. It was thought that this audible alarm came from the payload box so a brief hold was implemented to check out all the systems. However, in retrospect we realized that the audible alarm was actually from the battery monitor onboard our DJI Phantom II quadcopter, which also has the exact same audible alarm (that’s where we got the idea). So realistically, the hold in the count was completely unnecessary. The flight itself operated nearly perfectly. All the on-board flight tracking systems worked perfectly throughout the entire flight, including our new micro-payload that was introduced on OLHZN-10. 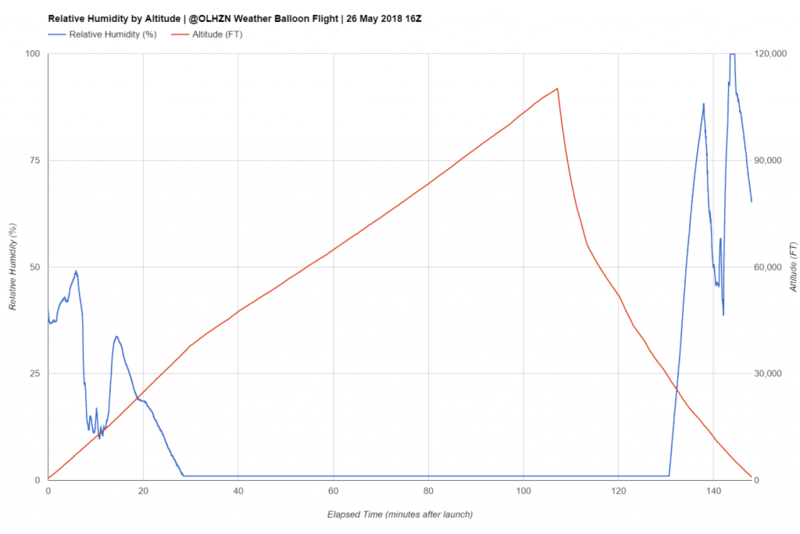 With the new guitar wire antenna, this flight was able to last the entire flight and operated flawlessly. After balloon burst, our new landing prediction software kicked into gear, as expected, however, the initial landing predictions were very far off from the actual landing site. 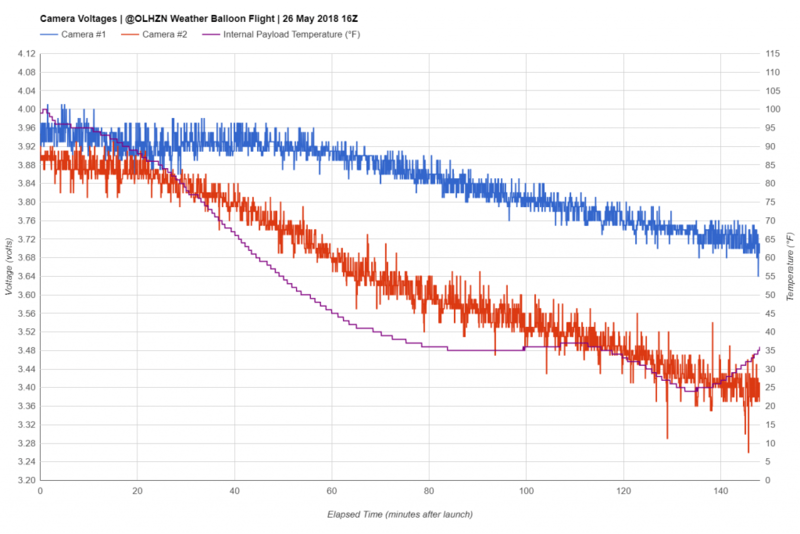 It was discovered after the flight that some erroneous speed readings had some of the wind speeds measured at over 7000 mph, which was obviously incorrect. The software was adjusted to ignore any wildly incorrect readings and performed much better on OLHZN-13. 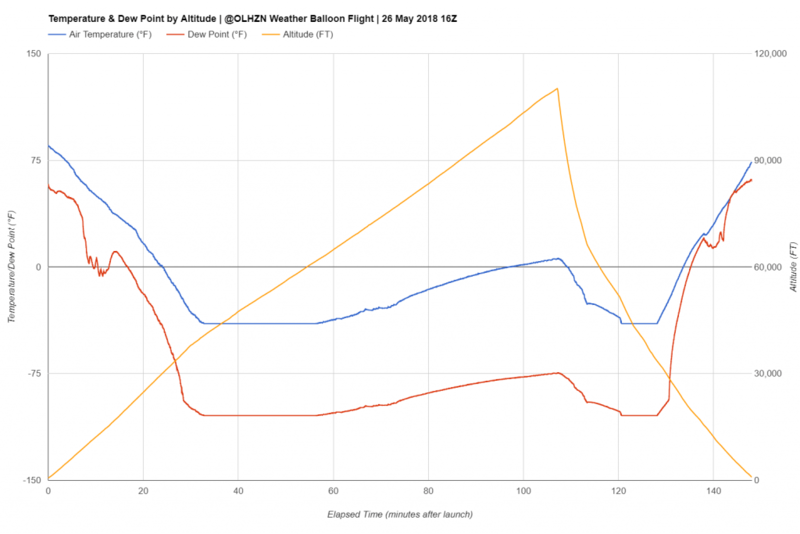 Once the payload descended below the level of those erroneous wind speed readings, the landing prediction software operated very well. The initial predictions were within 1 mile of the actual landing site while the payload was still a 30,000 FT. in altitude. About 15 minutes prior to landing, the landing predictions were within 500 feet of the actual landing site, which is fantastic and plenty of time for ur recovery team to be as close as possible to the landing site upon final approach. The actual recovery for this flight was very easy as the payload landed in an open field with easy access and no obstructions. Recovery lasted about 3 minutes and was one of our easiest recoveries to date. The payload did take a hard landing and the micro-payload that is located on the outside had what appeared to be cosmetic damage, however, during the launch procedures on OLHZN-13, it was discovered that the GPS breakout board was physically damaged and no longer functioning. 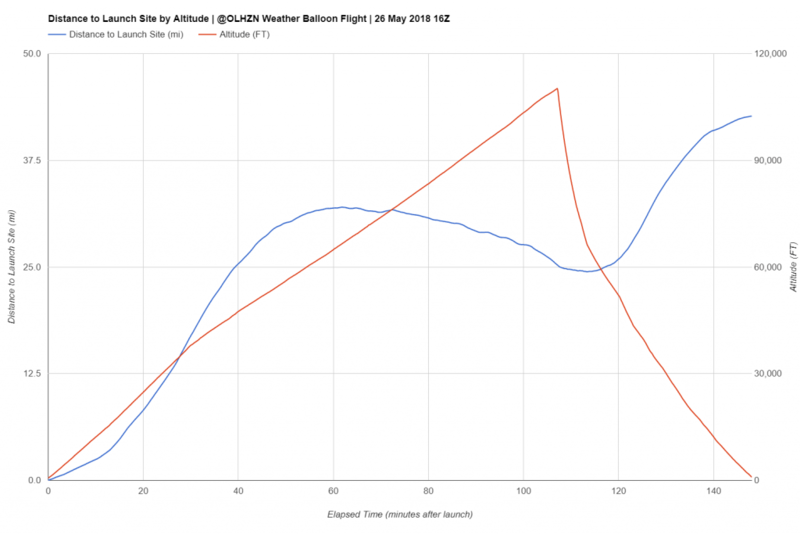 The maximum altitude achieved for this flight was 110,199 FT. (33,588 m) MSL which occurred 107 minutes into the flight at 1:51:14pm EDT (17:51:14 UTC). Downrange Landing Distance: 42.73 mi. 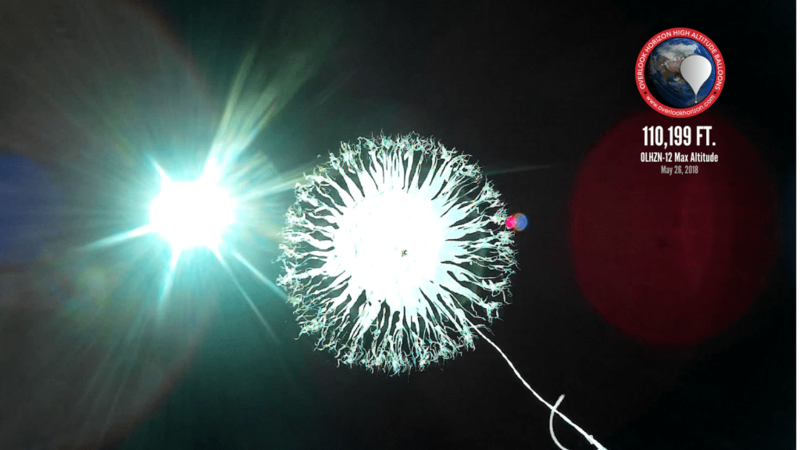 This flight again featured three Lightdow LD4000 Cameras including one as an upwards facing balloon camera to capture the balloon burst event. We implemented a new guitar wire antenna on our micro-payload system that previously failed on OLHZN-10 and OLHZN-11. 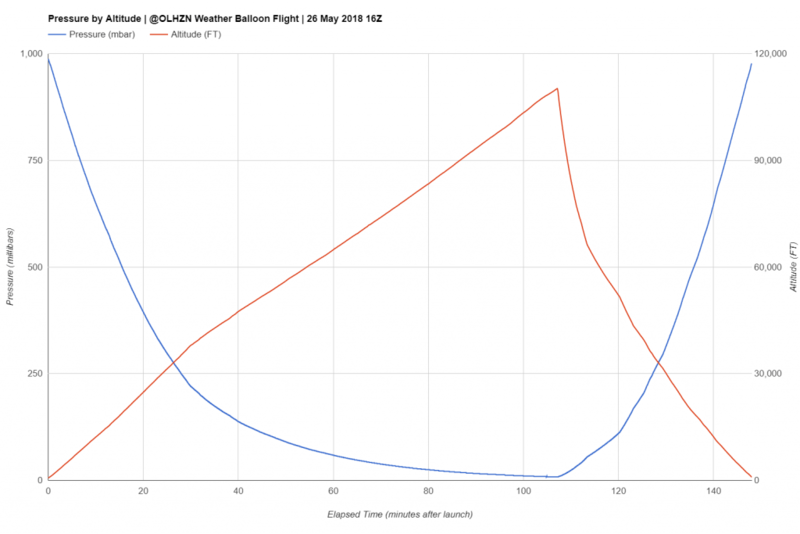 It was observed on OLHZN-11 that the solid core copper antenna used on both of the two flights was breaking off just after the balloon burst. The new guitar wire antenna was much more flexible and allowed the antenna to survive the stressful descent phase of the flight. 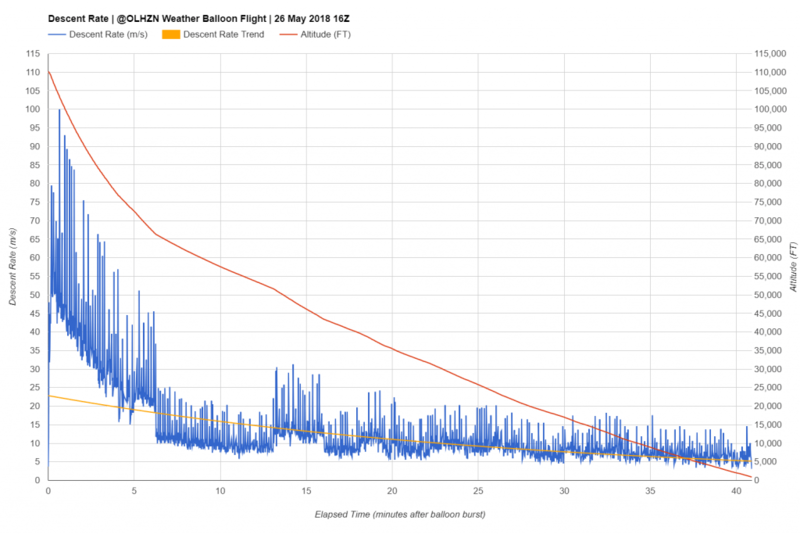 We also implemented some minor software changes to better format our flight data for post-flight analysis and faster publishing of flight data. This flight will debut our new experimental on-board landing prediction software. 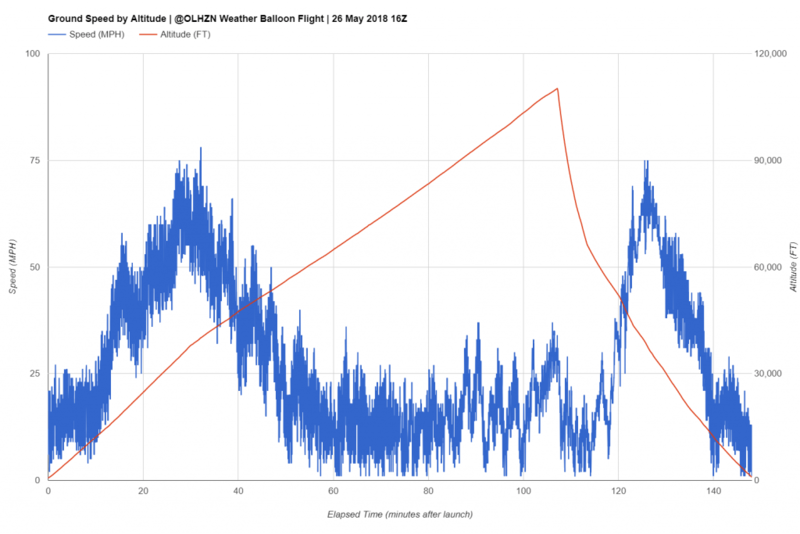 This new software will collect wind profiles during the ascent phase of the flight and then use that collected data to continually predict its own landing area in real-time with the hyper-local wind data that it collected during ascent. This data will be fed to our chase team (and anyone following our live flight map) during the decent phase to hopefully allow us to be as close as possible to the landing site as the balloon descends. 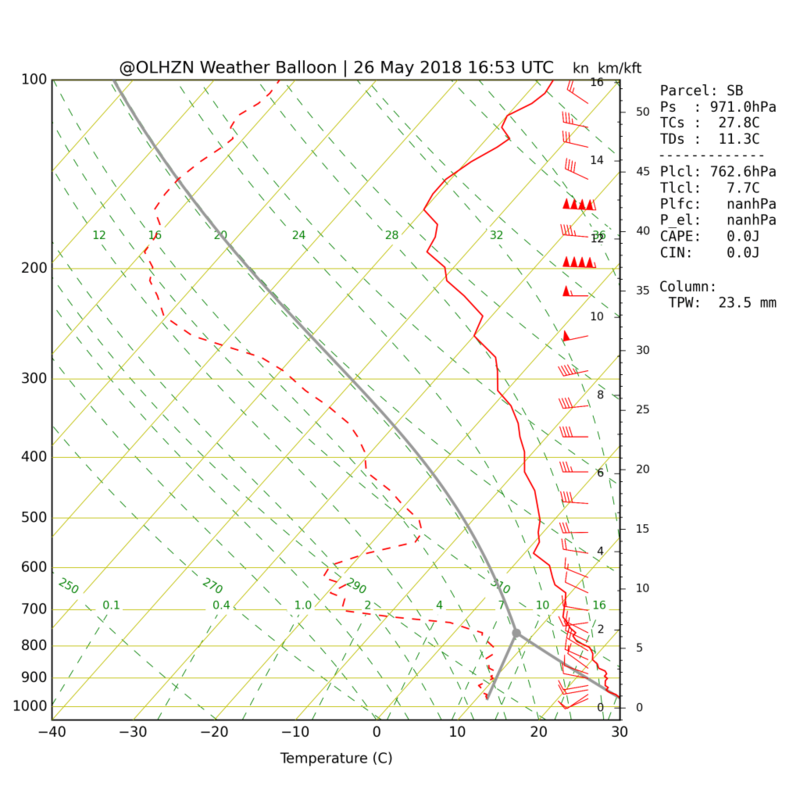 The raw data and raw sounding file used to generate our Skew-T Log-P graph can be viewed here. The flight paths below represent our pre-flight predicted flight path (purple) and our actual measured flight path (red) from the flight computer. 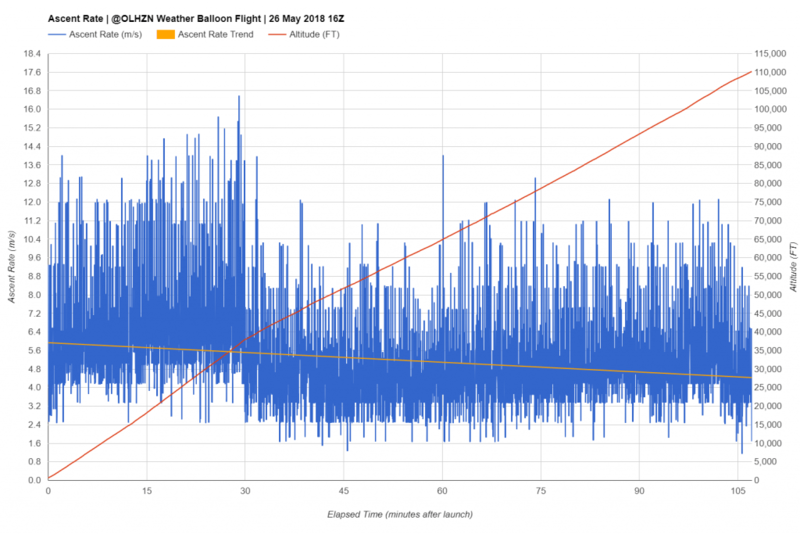 This flight came up short of its expected landing, mostly due to a faster ascent rate than intended. 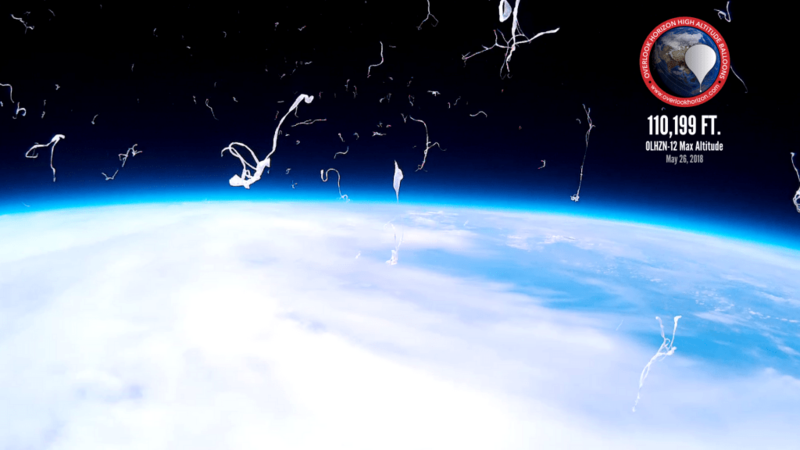 This is not an uncommon occurrence due to the imperfect nature of balloon filling procedures.